Wooden bikes may be beautiful, but they’re also a tad impractical. 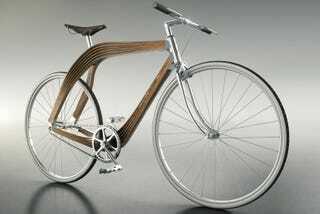 Nevertheless, there may be unexpected value in wooden bike frames, which architects can use to understand important structural challenges and prototype new designs. The bike frame is composed of lamellas—millimeter-thick sheets of birch wood glued together into strips that splay out at the points where the crank and peddle are fixed, as well as below the seat. The natural fibers of each lamella were aligned to enhance the structure’s overall strength. Zhelev and his team are finding that this layering method offers lightness, improved flexibility and enhanced durability over traditional wood-based building materials. Images reproduced with permission from AERO. You can check them out on Facebook and find more work from these designers here and here. Renderings were done by Maveo Schneider & Kreitmeir GbR.